Secretary of State calls for campaign of pressure to force North Korea to halt to its nuclear and ballistic missile programs. U.S. Secretary of State Rex Tillerson on Friday called for a campaign of pressure to force North Korea to change course and put a halt to its nuclear and ballistic missile programs. 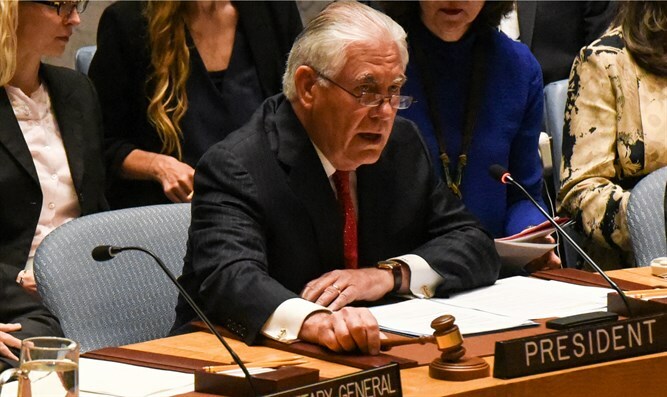 "Failing to act now on the most pressing security issue in the world may bring catastrophic consequences," Tillerson told the Security Council, according to AFP. "The threat of a North Korean nuclear attack on Seoul or Tokyo is real, and it is likely only a matter of time before North Korea develops the capability to strike the U.S. mainland," he warned. Tillerson told the Council there was "no reason" to think North Korea would change course under the current multilateral sanctions regime, warning, "The time has come for all of us to put new pressure on North Korea to abandon its dangerous path." "I urge this council to act before North Korea does," he added. Tillerson’s comments came a day after President Donald Trump, in an interview with Reuters, warned of the risk of a "major conflict" with Pyongyang. "There is a chance that we could end up having a major, major conflict with North Korea. Absolutely," Trump said, while stressing he wanted to peacefully resolve the crisis. "We'd love to solve things diplomatically but it's very difficult," Trump acknowledged, while lavishing praise on Chinese President Xi Jinping for Chinese assistance in trying to rein in North Korea. The two leaders met in Florida earlier this month, and officials said last week that Trump's strategy toward North Korea hinges on China. At the Council meeting on Friday, China said it was not realistic to expect one country to be responsible for solving the conflict. "China is not a focal point of the problem on the peninsula and the key to solving the nuclear issue on the peninsula does not lie in the hands of the Chinese side," Foreign Minister Wang Yi said, according to AFP. The Security Council meeting follows weeks of warnings from the U.S. administration that it is running out of patience with North Korea’s repeated ballistic missile and nuclear tests. "All options for responding to future provocation must remain on the table," Tillerson said, adding, "Diplomatic and financial levers of power will be backed up by willingness to counteract North Korean aggression with military action, if necessary." Tillerson called on all countries to downgrade diplomatic relations with North Korea and impose targeted sanctions on entities and individuals supporting its missile and nuclear program.